Markers denoting the location of landmarks and search results in mobile apps are used extensively in many applications. The presence of large volumes of markers clutters the information space, making it hard for users to visually differentiate between highly important or recommended locations, or to browse the depicted locations in order to identify suitable choices. In this paper, we present the results of a participatory design process to improve the utility of marker icons in a tourist application. We explore three alternative designs derived from this process by implementing and testing a mobile application that recommends venues based on their popularity (check-in count) in a well-known social network (FourSquare). 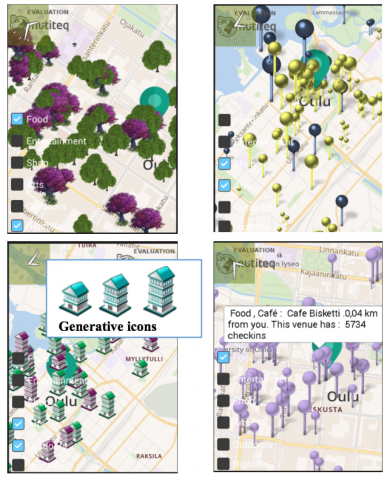 Our lab experiments highlight aesthetic, utility and performance issues in marker design that affect the usability of mobile map applications.